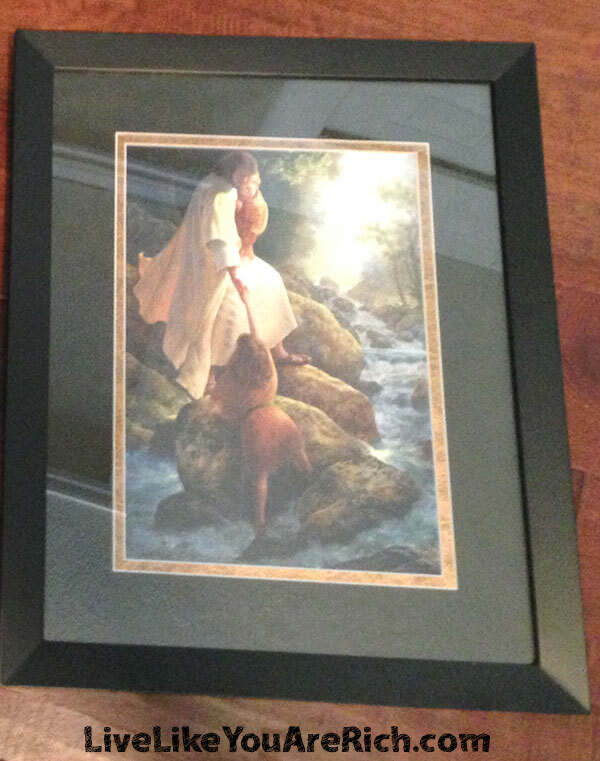 I found a beautiful matted image of Jesus Christ helping a child overcome an obstacle in her path one day while garage selling. 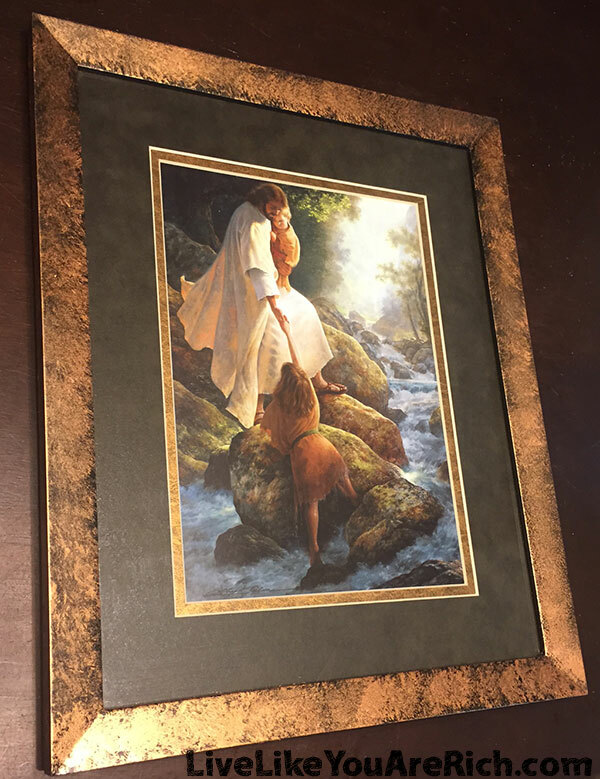 The artist is Greg Olsen and it’s entitled, “Be Not Afraid” (found here). The print was brand new and fit perfectly in a frame I already had. The only problem was the inner matting has a metallic leaf type of a look and the mat is a dark green, so my black frame did not match it. I looked around in some inexpensive dollar store type places and thrift stores but couldn’t find anything I was looking for. So I decided to make my own metallic/gold leaf frame. 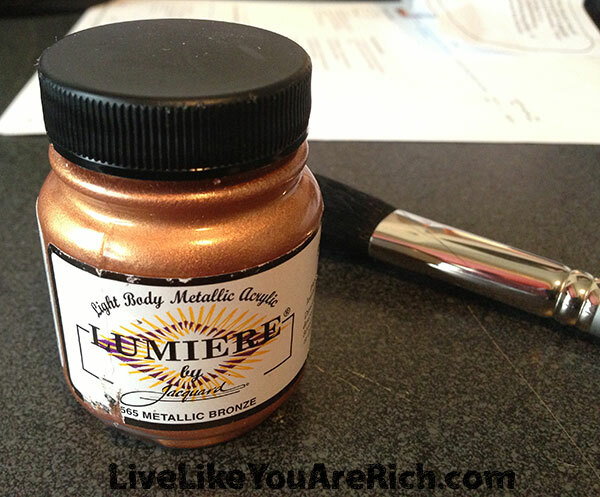 I got metallic paint (this brand is great). 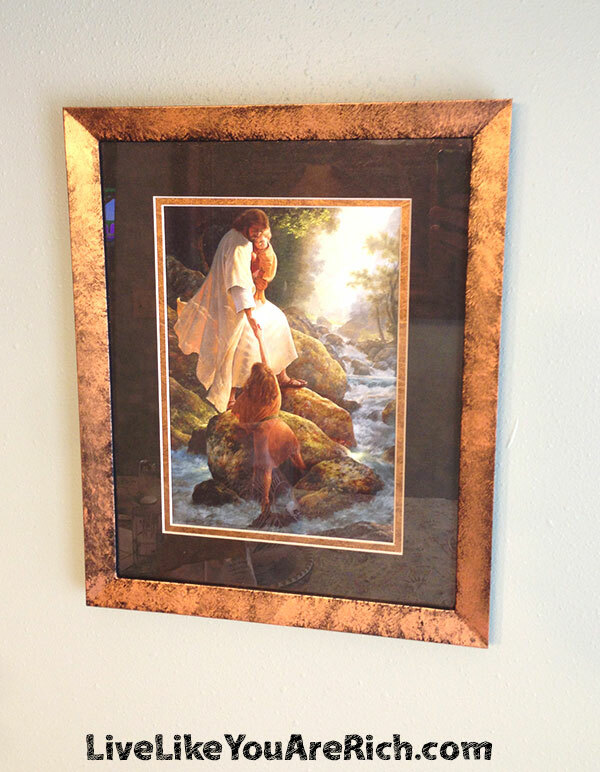 I used this Jacquard Lumiere 565 metallic bronze. I also used a regular cheap blush brush (I have a ton on hand) but any big bodied brush will work. Then I simply dabbed the paint onto the frame. This type of paint comes off of the glass very easily. If I accidentally got it on, I simply wiped it off with a paper towel and glass cleaner. I went around the top, inside, and outside edges. If an area wasn’t what I wanted I simply sprayed it with glass cleaner and wiped it clean with a paper towel and went over that area with the brush and paint again. Once everything looked exactly as I wanted, I hung the frame on the wall. This brand of paint dries super fast and I was finished in just a few minutes. Note- It turned out great. But it is very difficult taking photos of a frame with glass to not get glare on it. So sorry they are all at some type of an angle. Such an easy project! 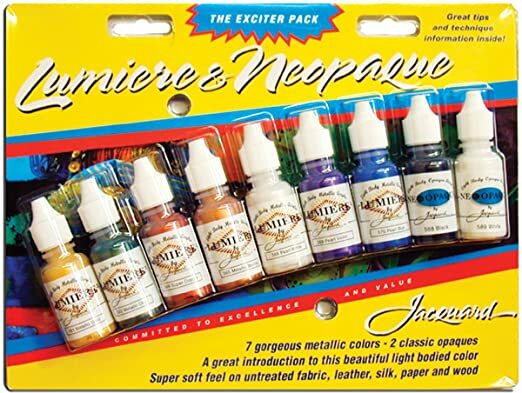 And with this many colors available, possibilities are endless. It looks beautiful on my wall. 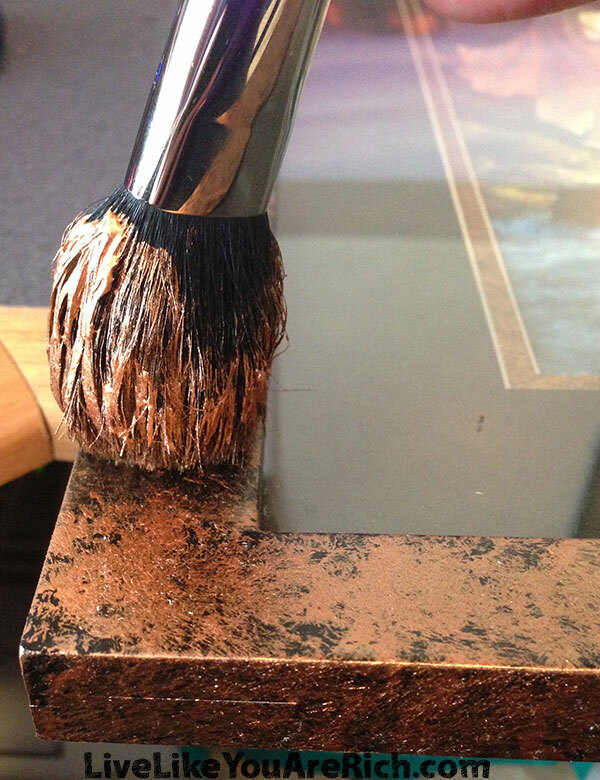 clean cheap blush brush or any big bodied brush will work. 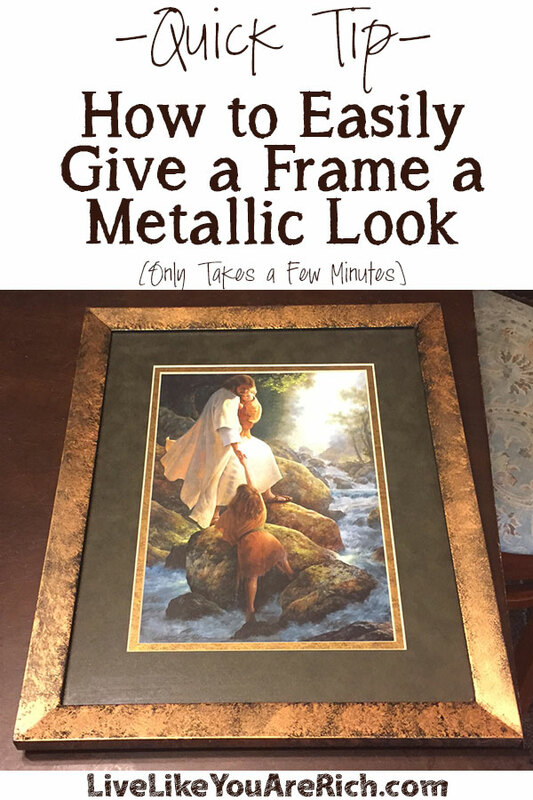 As you can see, giving a frame a metallic look is super easy and inexpensive! For other ‘rich living’ and holiday tips, please subscribe, like me on Facebook, and follow me on Pinterest. Woah! This looks amazing! And how simple! We just moved into our new place so I am redecorating. I might have to try this out! Thanks Chelsea! I hope your move went well! Yeah its super easy and quick!